Mathematics originates with intuition. But intuition alone can only go so far and formalism develops to handle the more difficult problems. Formalism, however, has its inherent dangers. There are three types of formalism. Type I formalism, exemplified in the work of Euler, is basically heuristic reasoning, the use of familiar reasoning in areas where the reasoning might not or ought not apply. The results include startling successes, and also theorems admitting exceptions. Type II formalism, associated with names like Bolzano, Cauchy, and Weierstrass, attempts to clarify the situation by means of precise definitions of the terms used. Type III formalism, the axiomatic method, leaves the fundamental concepts undefined, but offers precise rules for their use. Such precision deserts intuition and one pays the price. Most dramatically, the formal definitions of Type II formalism allow for the construction of monsters – bizarre counterexamples that exhibit behaviour inconsistent with existing intuition. The initially repellant nature of these “monsters” leads to dissatisfaction that is only dispelled by their growing familiarity and applicability. 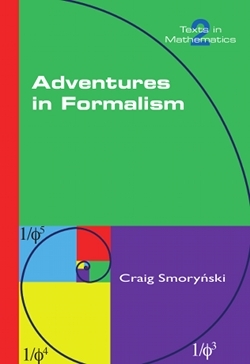 The present book covers the history of formalism in mathematics from Euclid through the 20th century. It should be of interest to advanced mathematics students, anyone who teaches mathematics, and anyone generally interested in the foundation of mathematics.